Coat a 15x10x1-inch baking pan with cooking spray; set aside. In a resealable plastic bag, combine onion powder, garlic powder, paprika, cilantro, mustard, chili powder and the 1/4 teaspoon habanero chile pepper; set aside. Cut off and discard tips of chicken wings. Cut wings at joints to form 24 pieces. Place chicken wing pieces in plastic bag with seasoning mixture. Seal bag; toss to coat wings with seasoning mixture. 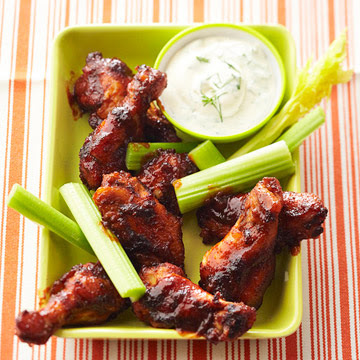 Arrange wings in prepared pan. Bake in a 375 degree F oven for 25 minutes. For sauce, in a small saucepan, combine barbecue sauce, spreadable fruit and steak sauce. Cook and stir until the ingredients are blended; set aside. Carefully brush wings with half of the sauce. Turn wings and brush with the remaining sauce. Bake for 20 to 25 minutes more or until chicken is tender and no longer pink. Serve with your choice of Dipping Sauces and remaining barbecue sauce mixture. Makes 12 appetizer servings. In a small bowl combine mayonnaise, yogurt and fresh dill or dried dillweed.